Estate car contenders | What Car? The Skoda Octavia Estate proves that you dont need to give up passenger space, decent levels of kit and driving manners just because you need a big boot. This may all sound a little familiar to regular readers, because the Octavia Estate has been our recommended estate car at the lowest price point for five years running. Since 2007, nothing has managed to surpass it in terms of space, driveability and value. This year the new Seat Ibiza ST has proven that supermini estates can be stylish as well as good to drive, but it still wasnt enough to sway us from the Skoda. The 1.4 TSI engine is efficient, smooth and sweet-revving, and packs just enough punch. 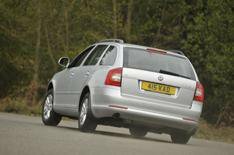 Alloy wheels, air-conditioning, electric windows and a CD changer all come as standard, proving the Octavia is no spartan load lugger, but a great family estate. A step in the boot floor is the only blot on the cars copy book, although the 580-litre boot expands to 1620 litres when the seats are down, which should be enough space for all. Last year Ford cut its prices on the Mondeo, then gave the car its latest 2.0-litre diesel engine and a face-lift. All this means the Ford Mondeo Estate is now one of the most complete cars you can buy. Throw in a Grand Canyon-sized boot and youve got a car that will please your fleet manager and gives parents who thought their only option was to get an MPV something to satisfy their family-carrying needs. Talking of which, even loaded to the gunwales the 2.0-litre TDCi takes everything in its stride. It has so much torque that youd never know this is such a big car, and itll average 53.2mpg. Driving ability isnt sacrificed for the headline economy figures, either. Agile when you want it to be and comfortable on the motorway, the Mondeo strikes the perfect balance between ride and handling ability. A long list of standard equipment is the icing on the cake. The Volkswagen Passat ran the Mondeo close, but when we considered the overall package, the Mondeo ended up on top. BMW brought out a new 5 Series Touring in 2010 and it went straight to the top of our posh estates list. Sure, it might not have the ultimate load size of the Mercedes E-Class Estate, but the 560-litre boot will swallow four golf bags and the car beats most rivals on ownership costs. The 520d averages 55mpg, and CO2 emissions, company car tax bills and leasing costs are all comparatively low. You do have to be careful how you spec the 5 Series, however, and we would recommend the Variable Damper Control system, which blends a smooth ride with the kind of sharp handling you expect from a BMW. Without it, the car feels unsettled and can lurch from left to right as you go from corner to corner. The eight-speed automatic gearbox is smooth and suits the 5 Series Touring well, but this and VDC both cost almost 2500. Still, the 5 Series Touring has a classy, roomy cabin. Next year, well have new rivals from Audi, Saab and maybe even Jaguar, but theyll have to go some way to beat the BMW for its running costs and refinement. Ive got a wife, two young kids and in-laws who live hundreds of miles away. When we go to visit, we go for a while and tend to take what seems like half our worldly possessions with us, so my car of choice is always an estate. Thats because, for all the merits of MPVs, crossovers and 4x4s, they rarely challenge the outright space, refinement, usability and economy that the best estates deliver. It was with this combination of criteria in mind that we drew up our shortlist of contenders and they all deliver in these key areas. The Octavia is a classic no-frills workhorse. The Mondeo is big, safe, comfortable and great to drive. The 5 Series offers unrivalled running and ownership costs in an executive class package. No wonder the final decision was a close-run thing.